Make sure the meter is designed for the size of your incoming water main. Common sizes are 3/4″ and 1″. If unsure, look on your water bill for the pipe size or ask a plumber. The meter should be made from a sturdy but safe material. Keep in mind that all of your household water will be passing through this device before it reaches you! Don’t get a cheap meter designed for garden hoses and install on your water main. You want something that will last and not leak. Make sure that the data resolution or definition is sufficient. To detect leaks and small flows, you want to be able to measure at least every 1/10 gallon of flow. I settled on a stainless steel high definition meter with pulsed output from EKM Metering. (They were helpful in answering my questions and had prompt shipping.) Once you have selected a meter, you will likely need a plumber to install it. Unfortunately that will probably cost more than the meter itself. If you have the skill, you could save a lot of money doing it yourself but it is definitely not a project for amateur plumbers! Once the meter is installed, the next step is to interface the data output with Home Assistant. Almost all the meters in the $150 range work by having a photocell detect the movement of the mechanical dial on the face of the meter. (In fact, if you have an existing meter with dials like those shown in the photo, you may be able to just purchase and snap on the optical detector and avoid the costly steps outlined so far.) 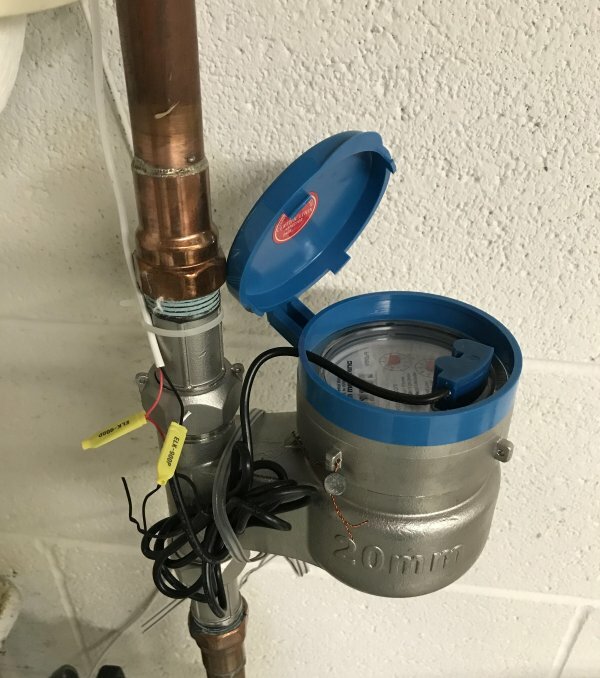 This type of metering provides a “pulsed” output which is basically just a switch closure every time a certain amount of water passes through the meter. (In the case of the meter referenced above, it is one pulse every 0.075 gallons) We need to count these pulses and somehow push the data to Home Assistant. Some meters have an external ZWave device that does the counting and data transfer for you. If you get one of those then you are basically set. However, for us DIY hardware tinkerers, that would be too easy. I wanted more control, so I decided to build a pulse counter and data node using a Raspberry Pi. I suggest using a non-zero Pi with Ethernet built in, but any Pi can work as long as you place it on the same network as your Home Assistant installation. I do not recommend using the same Pi that is running Home Assistant, since we don’t want anything slowing down the measurement activity. Counting pulses is a pretty basic task for the Pi and the core counting code has been posted below. Note that the water meter output is basically a pulse width modulation (PWM) waveform with a duty cycle that varies with the water flow rate. 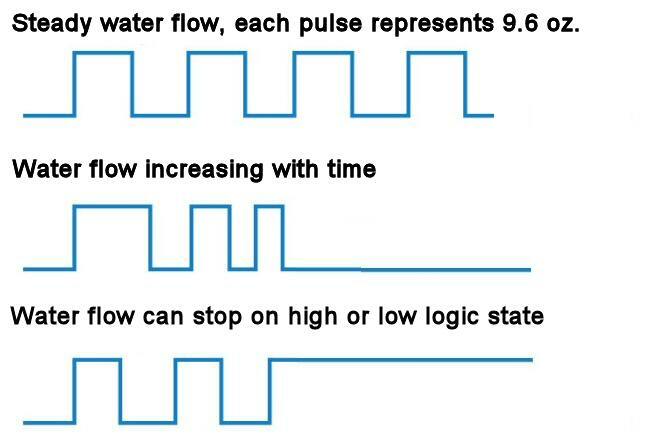 Also note that due to the nature of the mechanical source of the data, when water flow stops, the pulse can be either high or low and remain that way until the next flow activity. For that reason, I decided to only count the rising edge of the signal. The Python script counts the pulses and calculates the flow rate. The data is transferred as sensors to Home Assistant using MQTT. Originally I used HTTP sensors but the overhead was higher than it needed to be and MQTT seems to be a more natural fit for the tiny real time data being transferred. In addition to flow rate, I included some binary sensors for sustained flow and high flow as well as daily cost, which can be configured through variables. You’ll want to run the script in the background continuously as a service. I decided to get overly fancy and installed the Nginx web server as a front end for meter configuration settings and SQLite for the back end. In fact, every pulse is saved in the database so that intricate usage analysis can be performed if desired. To make the Pi’s environment easier to replicate, the major functions are running inside two Docker containers. I’ll add more of the coding details below as time permits. Water usage data is a great addition to Home Assistant and provides a lot of insight into how your household and its appliances use (and waste) water. The more utility data you integrate into the system, the better the potential automations become. Great post, and exactly what I was looking for help with. Thanks!